We are still waiting anxiously for the arrival of my granddaughter. Her poor mom is ready to go anytime, although technically the due date isn’t until this coming Sunday(21st). I’ll keep you posted! On the crafting front, when my daughter Hillary was home a few weeks ago, she made herself a pillow! This is quite an accomplishment for her, because she is not the most avid seamstress. Sewing is just not her thing. 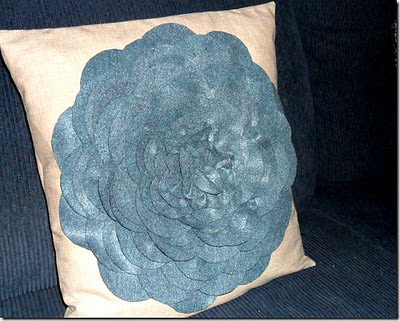 She had seen the Petal Pillow tutorial by Allison Harris at Cluck Cluck Sew. (which is a fabulous tutorial by the way) After some intense digging and searching through my (cough) considerable stash, she opted to use an almost burlap colour cotton for the pillow slip itself. 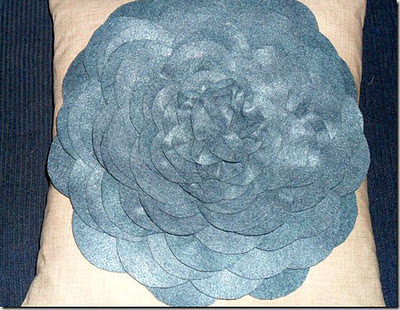 She bought some denim blue felt for the petals, and started right away. I’m so proud of her because she did the whole thing herself, despite never having followed any type of pattern (or tutorial) or used a sewing machine in her life. It looked so funny seeing her sitting there at my machine, so intent on her project. It was so nice to spend that time together, her working on her pillow, and me working on my own project. (which I will post later) So without further ado, I give you Hillary’s pillow. Didn’t she do a great job? It matches my living room sofa perfectly! Unfortunately, she took it home with her, lol. She plans on making another one to match next time she is home. Okay, that is amazing for never having sewn before. I'm not sure I could do something so lovely!